It’s an interesting time in Don Brodie’s life. He’s fit, active both physically and mentally, loves his wife Joan, his family and his home. He is quite content where he is at. However, he’s also 82 years old on a farm on Airport Line, living in a great, big house that is run almost entirely off grid. He still chops his own wood and the pair travels all over visiting family. It’s that darn number. It creates pressure to think about the dreaded next phase of life: retirement. Don is NOT looking forward to it but his age tells him he must consider it. He’s practical, of course. He has sold the farm to the son who lives next door with the agreement he and Joan get to live in their home for another five years. The problem is, he’s not ready yet. He doesn’t want to go. I learned these things on a wet, windy day when I visited their gorgeous stone home on Airport Line. Having met at a meeting a year prior, I’d told Don and Joan they would make a good story. As we sit in their spacious sitting room, we discuss ideologies as the pair share the wisdom of eight decades of living. Originally from Chatham, Don studied agriculture at Ridgetown in 1953. He married, had a family and in 1961, moved to Airport Line in Huron County. “Land was half price compared to Chatham and it was white bean country,” is how Don explains the move. Crops were going well and he hoped to get into chickens but the financing didn’t pan out. He decided to raise beef cattle instead. The old bank barn allowed him to finish 100 head at a time, twice a year. More farms were purchased, business was going well, but a difficult divorce changed the pattern of life again. Don married Joan, who was also divorced with children, and the couple moved to Bayfield with an intention to retire early and remodel the entire home. The home did get redone but Don found he was at the farm daily, helping his son run the business. Finances being what they were in the 1980s, Don took an off-farm job as a carpenter with Wayne Stirling to make extra money. The skills he learned at this job enabled him to do much of the work on a grand addition to the stone house he and Joan decided to live in once Don realized retirement definitely wasn’t for him. The renovation took two years and included relocating a shop to the home farm next door. The old summer kitchen on the house was moved to the bush and the new addition including a double garage with a FROG (family room on garage) was designed with the help of Walter Stirling. Don was able to complete most of the inside work himself. This gave the couple space for their large, combined family of children and grandchildren. Between them they have 21 grandchildren and 10 great grand children. They moved in when renovations were complete in the spring of 2000, keeping the old stone walls as part of the decor in the new addition. “I like having something around that is older than me,” says Joan, also in her 80s, a retired school teacher who spent most of her career at Huron Centennial school. She had great admiration for her husband’s work ethic and his handy skills. It’s hard to determine where she is at on the retirement scale but there’s a sense she is more ready than he is. She’s okay with that. Joan has an active life. Their home features a stunning kitchen combining an old fireplace with modern appliances where she is content to cook and serve meals to friends and family. Off-grid seemed an ideal solution and essentially, the couple is. Technically, they are not. They kept the hydro connection to save costs for the next owners who can choose their own source of power. 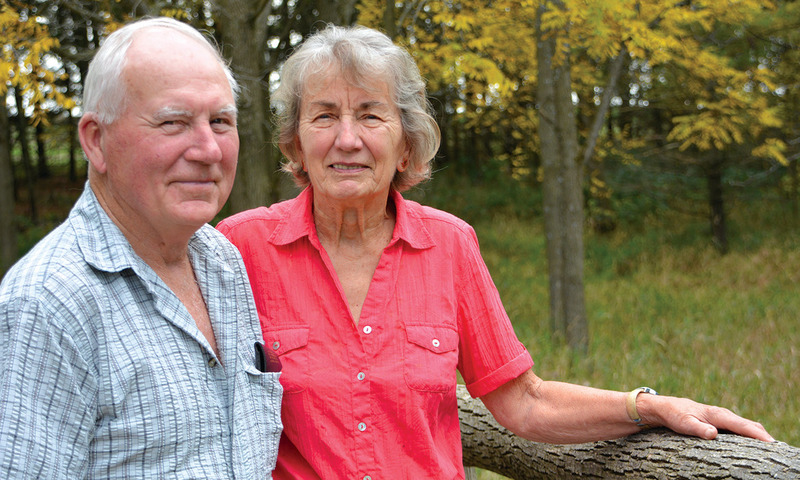 For Don and Joan, the choice of energy generation was windmills, solar panels and an outdoor wood furnace. With a keen interest in windmills, Don bought a how-to book from Huron County eco-entrepreneur Bob Budd and built a brake drum turbine using a brake drum from an old Ford truck. “It worked but I never put it up because it was so heavy, it would have required a very strong tower,” says Don. He decided to go in a different direction and installed solar panels on the shed. They worked very well in the summer but were less effective in the winter. So Don purchased a wind turbine and built his own tower to hoist it high by combining two television towers. It also works well and Don takes it down annually to check the brushes, joints and supports plus grease the bearings. The solar panels are rated at two kilowatts, the windmill at one kilowatt and between the two and the backup battery it charges, the couple has all the power they need. “We actually don’t know when the power goes out for everyone else because we always have power,” says Don, trying not to look smug as he says it. Next step was heating. Don chose to go with an outdoor wood burning furnace. To feed it, Don says he is “always cutting wood.” he takes his flip phone with him and has a calling system in place to give Joan peace of mind. Don cuts and fills boxes made out of pallets which hold about a quarter of a cord. He used to need 30 boxes to feed the furnace over the winter. Now that they spend two months in Arizona, he doesn’t need quite so much wood. However, he really likes the work. “I think it’s what keeps me young. I like the work and being in the bush,” he says. He takes his wood storage boxes into the bush on the loader tractor and fills them on the spot. They sit outside for the summer and are put inside in the fall. Don has been especially keen to cut because a week after this interview, he was getting a new hip. This, along with the grey hair, a bit of a stoop in his back and wisdom lines prove Don is aging. What do you do when your mind doesn’t recognize it? You battle with yourself a little bit, admits Don. He knows he should think differently and he can even articulate that it should be a pleasure to leave this house and farm to the next generation. He just doesn’t feel it yet. So the dread is real. The knowing he will have to leave before his heart, mind or body are ready to. “It’s definitely a process,” he says. Joan says friends of theirs have moved into a retirement home and love it. Her thoughts are that its wise to make the move before you have to. “Move while you can still carry the boxes,” says Joan. She and Don know they need to have their names in a place. So they continue to enjoy the home they have built, that doesn’t require expensive hydro bills, which bears the witness of woodworking skill and creative gardening. There is a walnut grove out back where they made use of Ausable Bayfield Conservation Authority funds to fill in a wet area overrun with canary grass. There are hobbies too, of course. Don plays the organ. They both read and attend aqua aerobics at the Vanastra Recreation Centre three times a week. Don is usually the only man. They also live their Christian values by taking trips to countries like Peru with the Orphans of Canada mission. What makes these trips even more special is that they take grandchildren along to share the experience. The couple does email but computers aren’t high on the list of fun activities. Don was given a Fitbit from the hospital to track his steps but hasn’t quite figured out how to monitor his daily steps via the computer. All in all, it’s a good life. They see it. They know it. It’s just that they are in between stages and recognize their choices are getting limited as age-preparedness requires an honest look at retirement, housing and identity. “I don’t know that a farmer can totally retire. It’s our life,” says Don, getting contemplative. As he sits in his chair, thinking about difficult changes in his life – leaving his parents to move to Huron County, getting divorced, moving to town, moving back to the farm, the financial struggle of the 1980s, the technology push, the advancement of the years – he says it was hard but one finds the wherewithal to make the best of it every time. “You gotta enjoy your life. Enjoy your work, your family, enjoy nature, and not necessarily in that order,” says Don.